I ferried Kara to a Halloween party on Friday and got quite a shock when I popped round to pick her up. Dressed as a ‘scary doll’ complete with ‘made in China’ written on her neck, she was hardly recognisable. On Saturday Arne RSPB reserve hosted the Arne Forage Festival, a collection of countryside exhibitors demonstrating ancient skills like flint napping and bronze smelting along with stands selling local produce, homemade pottery, basket weaving, jewelry, wrought iron etc. The exhibitors set up in the field, but the event was marred by wet and windy weather. We had been asked to give a public ringing demonstration and planned, along with our friends from the Sound Approach, to set up alongside the other exhibitors. However we realised that the only place we could possibly trap birds was in the relative shelter of the reserve visitor centre and so had to change our plans and move our stand at the last minute. Unfortunately the net was closed more often than not due to rain. Partly due to having few birds to show and partly due to and our stand being tucked away in a corner of the car park, we got few visitors. The best bird of the day, this beautiful Firecrest was ringed before the public arrived. Margaret and I met seven years ago this weekend in the New Forest and we planned to go for a walk on the 27th and end up at the cafe at Beaulieu where we had our ‘blind date’ back in 2006, but with the ongoing gales and torrential showers we abandoned the idea for a comfortable afternoon at home. Feeling I needed to see some rare birds before this autumn drew to a close I headed off to Christchurch to look for a Pallid Swift that was found yesterday afternoon. 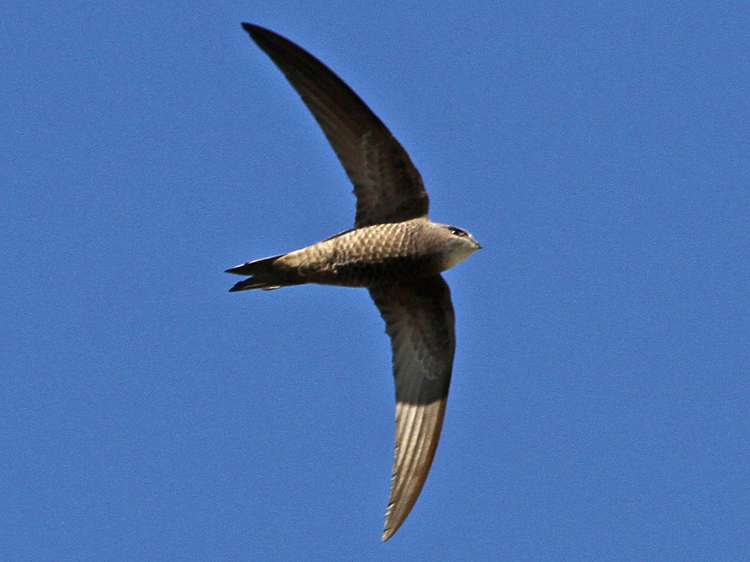 Although quite common in southern Europe and parts of the Middle East, Pallid Swift is a major rarity in Britain, although the fact that they are so hard to identify in all but perfect light may mean that ones occurring between May and August, when Common Swifts are present, are just overlooked. My only other experience of this species in the UK was of two on Portland in November 1984. For some reason I had thought the swift had been showing close to the 900 year old Christchurch Priory, so I found a car park to the west of there and started walking eastwards. The area known as Two Rivers Meet where the River Stour and River Avon meet before flowing into Christchurch Harbour is very picturesque. Although I have been to the Christchurch birding hotspots of Hengistbury, Wick and Stanpit over 100 times I don’t know the Two Rivers Meet area at all, so these exclusive flats with a private harbour and moorings were a surprise. Eventually, in worsening light, I neared the golf course which lies north of Stanpit Marsh and saw a swift distantly. Any swift species in October is likely to be a rarity as all Common Swifts leave Britain for Africa by mid-August, but views weren’t good enough to allow identification. With my parking ticket running out I returned to the car and drove around to the nearby houses where the bird had been showing well. As I parked it flew over my head. As I stopped to speak to Weymouth birder Brett Spencer we saw a Sparrowhawk appear from nowhere and pass within inches of it. We didn’t see it actually strike as they vanished below the level of the roofs but we assumed it had met an untimely end. Pallid Swift photographed in Sicily by gobirding.eu. Key ID features compared to Common Swift include the scaly underparts, paler head and throat, a paler area in the outer secondaries and inner primaries compared to the rest of the wing and darker underwing coverts compared to the body. One of the most interesting events Margaret and I have attended in the last couple of weeks was a talk in Poole by adventurer Ray Mears. Well known in the UK from his television programs on survival in the great outdoors and the skills of native people, he gave a fascinating talk illustrated with stills and videos on his travels in the boreal forests of Canada, Scandinavia and Siberia and of conservation initiatives that he has been involved in in many parts of the world. Here Ray Mears explains what to do if confronted by an uncomfortably close Black Bear – apparently the answer is lower your head and don’t look it in the eye. During the last week the weather has changed markedly. With the wind in the south it has remained unseasonably warm but there has been a lot of rain and high winds which had greatly curtailed our ringing efforts. However before the change in weather we had great success with our ringing program at Durlston Country Park with catches of between 54 and 122 birds in the week leading up to the 15th, most of these predictably were Chiffchaffs and Blackcaps but we consider it most worthwhile to continue to monitor the movements of these common migrants. On the 15th I was on my own at Durlston ringing a nice selection of birds that included a very late Garden Warbler, two Stonechats and a Treecreeper. Although there were plenty of birds I was coping well, but about lunchtime I started catching a lot of Swallows. Everything else was packed away and I concentrated that afternoon on ringing Swallows ending up with over 160 of them. Back in the 80’s I used to ring a lot of Swallows at roost and got a large number of controls i.e the capture of a bird previously ringed by someone else but I had no such luck today. Final total was 227 and I was pretty knackered after ringing for nine hours without a break. Although Stonechats breed at Durlston they are quite rare within our enclosed ringing area. The first Treecreeper we have ringed at Durlston. Given the sites coastal locality it was carefully scrutinised to make sure it wasn’t the mega rare Short-toed Treecreeper from the continent. We know that a properly trained ringer can extract and handle a bird without hurting it, however the reverse is not necessarily true! A large female Sparrowhawk sunk both its talons into the back of my hand and the only alternative was to release the bird or pull my hand away until the skin tore. I chose the latter. One day we trapped a Lesser Redpoll, the smallest, darkest and commonest (in the UK) of the various Redpoll taxa. With the winds increasing after the 15th I made a couple of visits to Fleets Lane site in Poole which is much more sheltered. The blue rather than bluish-green moustachial stripe, paler legs and most importantly the presence of wing moult identifies it as an adult (the first I have seen in the hand) and the all dark bill as a male. The bird was already ringed and was originally trapped as a first year at Lytchett Bay in 2012. There was a break in the constant windy conditions on the 24th and I was back at Durlston. There were a good number of birds including a few Meadow Pipits (above) and Swallows passing overhead but the migration of warblers has all but stopped with just a few Chiffchaffs and Blackcaps trapped. By far the commonest bird was Goldfinch, hundreds flew overhead and we managed to ring over 60. Up to 80% of the British Goldfinch population winters overseas and autumn is the time of peak abundance. As well as ringing birds I have been involved in fair amount of maintenance work in the last few days with net rides either cut or maintained at Holton Lee, Lytchett Bay and Arne (for a public ringing demonstration on the 26th). The above photo shows the excessively smelly and muddy net ride at Lytchett that we used to trap wagtails on autumn migration. Now that winter approaches the monthly counts of wildfowl and waders across the country restarts. Unfortunately the count on the 13th was marred by poor visibility and rain. You can hardly see the flats at the south end of Holes Bay let alone pick out small waders in the distance. Over the last few days there have been a number of rare birds in Dorset however either I haven’t managed to go and see them or my attempts have been unsuccessful. On the 21st a report of an American wader Lesser Yellowlegs at Swineham near Wareham drew a blank and on the 22nd whilst doing some net ride clearance at Holton Lee I heard that a Great White Egret had been seen earlier at Arne RSPB, again I had no luck but there were 28 Spoonbills at Shipstal Point – I wonder if they will ever stay and breed. At Arne the woods echoed with the calls of rutting Sika Deer stags. I didn’t take a camera (after all I just went out to do some brush cutting) so this record shot was taken using my phone. After taking the last photo I heard a clanking noise behind me and turned to see these two stags with their antlers entwined. Again a poor record shot taken on my phone. We continued our tour of Fiji by flying to the small island of Taveuni, which is to the north east of Vitu Levu. Although it is not far from Suva we had to fly back to Nadi and wait for several hours before crossing Vitu Levu again. We arrived at our accommodation mid afternoon with just enough time to score with another endemic, the Maroon Shining Parrot and walk to the Date Line. Actually its not the date line but the 180 degree longitude, as the Date Line detours to prevent Fiji being divided into two separate days. All these flights in small planes over the Fijian islands gave us wonderful views of coral reefs and remote beaches. The ‘Date Line’. Valerie is standing with one foot in the western hemisphere and one in the eastern. Some guy who forgot to tuck his shirt in is just in the eastern hemisphere. The dense moss covered forest where that most enigmatic of birds, the Silktail, can be found. I posted a photo of the Silktail on the 18th of September whilst I was still in Fiji. The aptly name Many-coloured Fruit Dove …..
… but the most amazing dove of the trip, if not in the world is the incredible Orange Dove which showed well at nearby Bobby’s Farm. and large numbers of Red-footed Boobies. The resort seen from the sea. Around the resort and on an offshore island were large numbers of Pacific Flying Foxes. Many were in a tree just outside my room and they made a huge racket at dusk as they were preparing to fly out to feed. Sat on a chair beside the swimming pool was this Fijian race of Collared Kingfisher. Well Collared Kingfisher according to the IOC world checklist, Clements checklist treats it as a race of Sacred Kingfisher. It am sure that DNA work would identify it as a race of neither, but a species in its own right. With our flight to Nadi not until late afternoon, we were at a bit of loose end today (there are worse places to be at a loose end than Fiji). Valerie, Vera and I went snorkeling, the gear and boat was easy to hire from the nearby dive centre. This photo of me was taken by Richard Clifford in Truk, Micronesia in 2010. This post continues my account of my trip to the South Pacific in September. The final of the three island groups we visited was Fiji, which lies within the tropics at 180 degree longitude, ie the opposite side of the world to the UK. We visited three islands, the first being the large island of Vitu Levu. We flew from Vanuatu to the capital Nadi but only stayed briefly before flying on to Suva on the southwest coast. Our accommodation was beside two lakes surrounded with forest. We soon scored with most of the endemics, seeing twelve of them the first afternoon and five including the stunning Golden Dove the next morning. Suva seafront gave us the chance to add a few waders and seabirds to the trip list and another forested area on the Namosi road produced excellent views of both Fiji Shrikebill and the rare Black-faced Shrikebill and brief views of a Friendly Ground Dove (the latter is named after the Friendly Islands, not its decidedly unfriendly habits). One of the first endemics we found was this pretty Fiji Parrotfinch just outside the airport at Suva. Another lovely endemic, this Pacific Robin was in the forest close to our hotel. Two endemics for the price of one,. A Fiji Goshawk dismembers a fledgling Wattled Honeyeater. Unfortunately the honeyeater was still alive, so this was quite a gruesome sight. Fiji is a paradise for pigeon enthusiasts. The delightful Golden Dove. Not as pretty as the Golden Dove but fascinating nonetheless. Sometimes called Peale’s Imperial Pigeon, but I prefer Barking Imperial Pigeon because that is exactly what it does. Some shots from Suva seafront. A dark morph Pacific Reef Egret. Pacific Golden Plovers and a Grey-tailed Tattler have flown all the way from the Siberian arctic to winter on these islands. The white spur in the axillaries identifies this frigatebird as a male Lesser.